Starting in February, the Sportsmen’s Alliance Foundation will host a second education program for youth and adults who are interested in learning how to hunt. The Learn to Hunt Program will take participants from the classroom, to the field, to the table, and it is designed for all ages who have little or no outdoor experience. Sign up here. 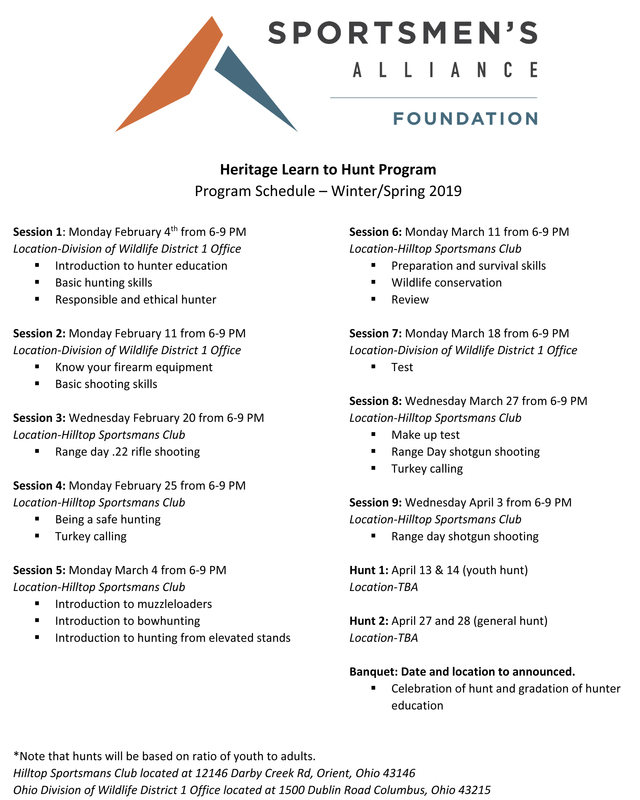 The Heritage Learn to Hunt program is offered to participants free of charge. This is made possible through the generous assistance of our volunteers, business partners and individual donors. Help us recruit participants. Send this to a friend or relative who might not hunt, but has an interest in starting. Encourage them to sign up. Contact us to volunteer/mentor as an instructor – (Frank Price: [email protected] or 614-888-4868). Make a donation to help us underwrite this program – DONATE HERE! Phase one will launch on Monday, February 4, 2019, and will run 6-9 p.m., with an introduction to hunter education class at the Ohio Division Wildlife District 1 Office (1500 Dublin Road Columbus, Ohio 43215). Phase two will take place at Hilltop Sportsmans Club (12146 Darby Creek Rd Orient, OH 43146) starting on Monday, February 20, 6-9 p.m. Participants will learn hands-on hunter education principles and firearm safety and skills, such as hunting in groups, crossing fence lines and hunting from elevated positions. Additionally, hands-on firearm safety will be a major component. Participants will develop respect and a comfort level with the firearms used during the program’s pheasant hunt. Click here for full course agenda. Phase three will take place on April 13 and 14 and/or April 27 and 28, and will include working with a mentor who will guide you on a wild turkey hunt, and who will help you clean and prepare the bird for the dinner table. Phase four will take place after the hunt when everyone will gather for a wild game meal. All participants, their families, volunteers and partners involved in the Learn to Hunt Program will sit down to share a meal of the harvested birds and all the fixings. It will be an evening to celebrate the experience and empower individuals as lifelong hunters. Again, this program is free to all participants – all educational materials, firearms, ammunition, hunting licenses and fees will be covered. This course is designed and intended for participants with little or no hunting experience. Youth must be accompanied by an adult also interested in learning to hunt. Regardless of age, gender, ethnicity or physical ability, all are encouraged to participate. For additional information or questions please contact Frank Price, Director of Education, at [email protected] or 614-888-4868.